IT is a characteristic of modern tendency in aircraft design that, except for flying boats, the "pusher" type of machine is now practically never seen. Much of the early ДальшеMore>>> experimental work was done on pusher machines, commencing with the early machines built by the Wright brothers, and continuing for a considerable time after the outbreak of the war, 1914-18. When Mr. A. V. Roe introduced the tractor type of biplane, the type met with such instant success that it very quickly became adopted, not only in this country, but throughout the world, until at the present moment it is almost the only type ever seen as far as single-engined machines are concerned, with the one exception mentioned above, i.e., the flying boat. We think the majority of those of our readers who had any experience of the pre-war pusher aeroplanes will probably agree that for sheer comfort in flying the old pusher had much to recommend it. For one thing one was not worried by a slip-stream of high velocity as soon as one looked over the cockpit coaming, and the engine noise was greatly lessened owing to the placing of the power plant behind the occupants. That the pre-war type of pusher aeroplane, with open tail booms incorporating a fair amount of wiring, was a superefficient type can scarcely be argued, but if one is not concerned with ultra-efficiency, there is much to be said for the type, and it is therefore rather interesting to find a German designer reverting to the pusher type in a machine designed for the recent German "Sales Competition." The rules for this competition were designed with the object of producing safe and comfortable machines, rather than machines of very high efficiency and having a high top speed. Among the stipulations for this competition, mention may be made of the fact that the take-off must not occupy more than 100 m. and the machine must pull up after touching in not more than 75 m., while the rate of climb must be greater than 1-5 m. per second (300 ft./sec). The top speed must exceed 90 kms./h. (56 m.p.h.). It was also stipulated that the machines must be of the pusher type. According to our German contemporary, Illustrierte Flug-Woche, the Albatros designers considered the following possible arrangements to comply with the regulations: the tail-first or canard type of machine, the tailless aeroplane, the pusher with open girder tail booms, and the fuselage machine with the engine in the trailing edge of the top plane. It was considered that the pusher with open girder tail booms was ruled out for aerodynamic reasons, the tail girder offering too great air resistance. The tail-first machine and the tailless machines, although offering interesting possibilities, were of somewhat doubtful qualities, as many problems have not yet been solved in connection with them, such as dynamic stability, controllability and behaviour in spins, and so the Albatros designers, by a process of elimination, arrived at the fuselage type with the engine built into the top plane. The result was the "flying boat on wheels" shown in the accompanying illustrations. The Albatros L.72 is a two-seater light 'plane, with a fuselage of mixed construction, and with the wing area arranged in the form of a biplane, the lower plane of which is considerably smaller than the top plane in both span and chord. The biplane type was chosen in order to get the greatest practicable wing area into the smallest overall size, and also to keep down the item of wing weight. The competition placed a premium on rate of climb rather than on top speed, and rate of climb was more easily obtained with light wing loading. It was also desired to give the two occupants as good a view as possible, and in order to attain this object the two main planes were very heavily staggered in relation to one another. A glance at the illustrations will show that the stagger is so pronounced indeed that the problem of building a biplane with the usual external wire bracing would probably have been extremely difficult, owing to the very poor angle of the inter-plane struts. It was therefore decided to make the machine a cantilever biplane, and the inter-plane struts are intended mainly to stiffen the wings against torsional stresses. Except for the unusual stagger, the Albatros L.72 is designed very much as is a flying boat, that is to say, the engine structure is independent of the wing structure to the extent that, although faired into the top wing surface, the engine is carried on four separate tubes, rising from the fuselage. The top plane is supported from the fuselage by two N-struts braced diagonally to centre them over the fuselage, but outside these N-struts there is no wire bracing of the wings. Both top and bottom planes have wing spars and ribs of spruce, and the spars of both planes run right through. The top plane is perfectly straight, but the bottom plane has a dihedral of 1 1/2 degrees. Fittings are mainly of duralumin and the inter-plane struts are steel tubes with sheet aluminium fairings. The wing section is a fairly thick one (about 9 in. on the top plane) and was chosen on account of its high value of the ratio KL^3/KD^2, which governs the climb. In the construction of the fuselage two distinct methods have been employed. The front portion, in which the cockpits for pilot and passenger are accommodated, is a flat-sided, plywood-covered box, built rather stronger than strictly necessary in order to provide protection for the occupants in case of a crash. The rear portion of the fuselage is in the form of welded steel tubes with piano-wire bracing, and the two halves of the fuselage are joined just aft of the passengers' cockpit. Incidentally it may be mentioned that the lower plane passes through the wielded tube portion where the question of its insertion and attachment is rather easier, owing to the fabric covering. As already mentioned, the 55 h.p. Siemens radial engine is mounted on four steel tube struts from the top of the fuselage, on a structure independent of the wing structure. A neat aluminium cowl fairs the engine into the top wing surface and a spinner round the propeller boss at the back completes the fairing of the power unit, of which only the outer portions of the cylinders project. The petrol tank is built into the top plane forward of the engine, and although it is stated that gravity feed is employed, provision is made for maintaining a slight pressure in the petrol tank. As the tank is ahead of the engine, presumably the only time when gravity feed would not suffice would be during a steep dive. The petrol tank has a capacity of 50 litres (11 gals.) and the oil tank, which is placed immediately ahead of the engine, has a capacity of 12 litres (2-64 gals.). The undercarriage is of simple type, the two wheels being carried on short stub axles hinged to the lower longerons of the fuselage and braced forward by tie-rods forming horizontal V's with the axles. Springing is provided by telescopic struts running to the top longerons of the fuselage, and rubber shock-absorbing gear. The tail planes are of duralumin and steel construction and fabric covered, and provision is made for trimming the tail plane, this obviously being advisable in a machine of this type, where considerable changes in trim may be expected between the "engine on" and "engine off" condition. It is stated, however, that the machine handles very nicely, and that the only change with engine fully throttled down is a slight tail-heaviness which is easily corrected by slightly increasing the angle of incidence of the trimming tail plane. 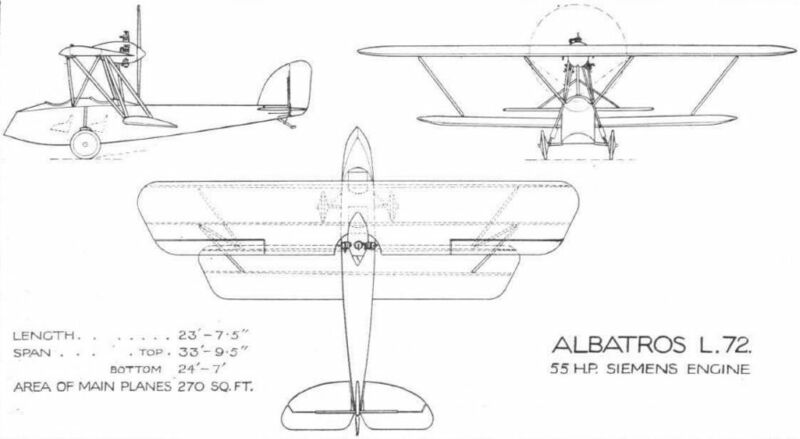 The main overall dimensions of the Albatros L.72 are shown on the general arrangement drawings. Following are the main item weights: weight of machine empty, 450 kg. (990 lb. ); pilot and passenger, 160 kg. (352 lb. ); petrol, 38 ks. (83-6 lb. ); oil, 12 kg. (26-4 lb. ); total loaded weight, 660 kg. (1,452 lb.). The wing loading is 5-38 lb./sq. ft. and the power loading 26-4 lb./h.p. With the useful load indicated above, the original machine attained a top speed of 125 k.ni./h. (78m.p.h.) at ground level, and the landing speed was 65 k.m./h. (40 m.p.h.). An altitude of 1,000 metres (3,300 ft.) was reached in 12 minutes. Albatros L.72 Light 'Plane: Side view. Note the pronounced stagger. The Albatros L.72: The 55 h.p. Siemens radial engine is mounted on the trailing edge of the top plane, and drives a pusher airscrew. The view from the cockpits should be excellent. The Albatros L.72: This front view shows that in spite of the interplane struts, the wings are of the cantilever type, without external bracing.